Derma V10 night cream is a specially rich formulation that is to be applied gently before sleep to provide a plentiful source of essential vitamins, allowing night-long skin rejuvenation. The special blend helps nourish, moisturise, restore firmness and increase freshness to the skins texture. Your skin feels firmer, smoother and more supple. Used daily on face and throat,Derma V10 decreases the appearance of wrinkles and increases skin's look of youthful firmness. A luxuriously light anti-ageing oil with a silky skin feel that won't block pores. A rich anti-aging formula which hydrates and nourishes the skin. Key Points: For all skin types Enriched with Caviar extract Nourishes & Hydrates skin Paraben Free Key Ingredients: Caviar Extract ? is a rich source of essential natural vitamins, minerals, fatty acids and protein. The chemical composition of Caviar is very similar to that of young skin cells and gives ideal nourishment to the skin to help fight aging. Rosehip Oil ? has antioxidant properties and is able to penetrate into deeper layers of the skin, it?s a natural source of Vitamins A& C which stimulates collagen production. Infused with natural oils, Michael Van Clarke's 3 More Inches Magic Oil and Finishing Serum nourishes and protects your hair whilst helping to combat frizz. Ideal for using as a quick hair fix, this gorgeous oil helps to ease styling whilst providing hair with instantly silky softness and shine. - E.D Directions for use: - For use after washing, spread three or four drops across palms and distribute though damp hair. Style as usual. - For use as a style refresh, spread a few drops through dry hair for instant softness and shine. Created to soften, nourish and de-frizz the hair, the 3 More Inches Thicken and Shine - Finishing Feed is a wax like balm perfect for all hair types. Working to seal the hair with intense moisture, it contains coconut oil, aloe and cashmere proteins which combine together to give the hair a salon perfect finish. K.D.Directions of use:Smooth onto dry hair.Style as desired. Amla also known as Indian Gooseberry is packed with natural antioxidants to help your skin glow! Clary Sage essential oil is renowned for helping balance out oily complexions and reduce the signs of breakouts. Together with refreshing and cleansing Lemon oil, they create a beautifully scented natural shower and bath gel to help your feel revived and refreshed. Enjoy the uplifting aromas of Peppermint and Cedarwood in your shower ? perfect to get you going in the morning! Packed with nourishing ingredients such as Brazil Nut Oil, Eucalyptus and Murumuru Seed Butter that help to gently cleanse and refresh the skin. A gentle formula that is non-drying and helps condition the skin. AA Skincare Ylang Ylang Argan & Rosemary Shower & bath Gel 250ml Soothing and relaxing. This refreshing and gentle shower and bath gel will help leave the skin feeling soft, smooth and ready to start the day. Made with Ayurvedic herbs, essential oils and natural ingredients, this shower gel is jam packed with gorgeous ingredients to help your skin glow! If naked is not close enough and body hair gets in the way, we're here to help. Our super hydrator uses a mushroom derivative that offers lasting hydration from below the surface while our plant proline complex minimizes the appearance of hair regrowth so you can show off your muscles better. Our aroma notes of young vetiver and forest woods add a subtle scent of masculine presence. Drag your abs out of hibernation. The AB CREW Men's AB Shredder Supplement (120 Capsules) is fortified with a proprietary multi-functional blend that works to blitz fat and drain water. The result: more defined looking muscles with less fat and water retention under the skin. - K.N. Drag your abs out of hibernation. The AB CREW Men's AB Shredder Supplement (60 Capsules) is fortified with a proprietary multi-functional blend that works to blitz fat and drain water. The result: more defined looking muscles with less fat and water retention under the skin. - K.N. 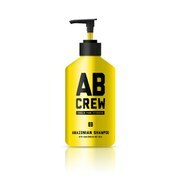 Refresh your hair with AB CREW Men's Amazonian Shampoo, a hydrating shampoo that works to cleanse and moisturise your hair with its blend of Amazonian nut oils and extracts. Sulphate free, the deep cleansing formula lifts grease and grime from your hair imparting a primal scent of high mountain woods. - K.N. Sulphate-free.